Smart payments company Coin this week announced the shutdown of its various product services, officially closing product support, social media channels, and the connected Coin app on iOS and Android devices on February 28, 2017. The news follows the discontinuation of all Coin products last May, when Coin was acquired by Fitbit and the company subsequently ceased selling its line of smart payment cards. With no new Coins available to purchase and its services shutting down, users will no longer be able to add new cards to the device without the mobile app being supported. Coins themselves will continue to work until their batteries die (two years from initial activation), so the company is encouraging users to add any cards they want before February 28. With the acquisition of Coin by Fitbit, all business operations ceased on June 13, 2016. The company is no longer manufacturing, promoting, or selling any new devices or products. Effective from February 28, 2017, the Coin product services will officially be shut down. As a result, support through the Coin website or through social media channels will no longer be available. The original Coin, as well as Coin 2.0, was a single credit card-sized device that stored a collection of credit and debit cards that users could toggle through with a small button on the front of the Coin. Once the desired card was selected, users swiped Coin like any normal payment card, and the charge went through to whatever card was chosen. Coin was first announced and began receiving orders in 2013, one year before Apple would launch Apple Pay in 2014, but Coins didn't begin arriving to customers until 2015. Although Coin's shutdown has been clear since the Fitbit acquisition last year, the growing popularity of smartphone mobile wallets like Apple Pay and Samsung Pay undoubtedly became large competitors to Coin's business in 2015 and 2016. In Fitbit's own press release last year, the company described a deal that focused on the specific acquisition of "Coin's wearables payment platform," although at the time there were "no plans to integrate Coin's wearable payments technology" into its 2016 roadmap. That still leaves future Fitbit devices in 2017 and beyond wide open for an "active NFC payment solution." Amid acquisitions of Pebble and luxury watch maker Vector Watch, Fitbit has faced lower-than-expected revenue results for the fourth quarter of 2016, leading to cuts of between 5 to 10 percent to its workforce. With Apple Watch gaining ground in the smartwatch space, Fitbit appears to be gearing up to launch a more feature-rich wearable with its own app store, mobile wallet, and more, instead of the activity-focused wearables it currently sells. This seemed like such a cool idea at the time. Now, it looks antiquated. Although, I still wish Apple Pay could mimic a card swipe the way Samsung Pay can. If Apple can figure out how to do that with the next iPhone, use of Apple Pay will skyrocket, I suspect. I think the better solution is for payment terminals to be upgraded. Here in Canada, pretty much anywhere that I can pay with chip-and-pin, I can pay with "a tap", which means Apple Pay is supported. It's fast, efficient and secure. No need for Apple to invest into supporting outdated hardware. This was a great product that never felt antiquated. I used it to pay for my VCR at Circuit City. 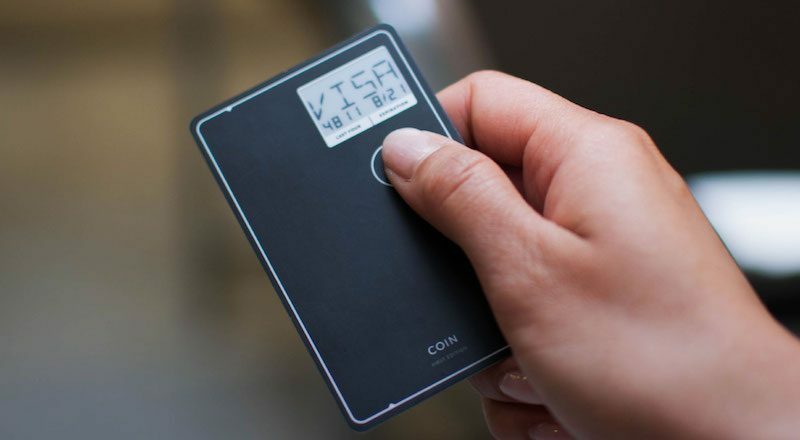 I thought another nail on Coin's coffin was EMV chips taking over. I pre-ordered a Coin in 2013, fully aware of the EMV liability switch taking place in October 2015. My thinking was that the Coin would ship in early-ish 2014, so it'd practically be at the end of its expected battery life by the time my credit cards would be re-issued with chips for the EMV switch. Instead, they delayed and delayed and delayed. By early 2015, I decided that even if they did ship before the EMV switch, I'd only be able to enjoy it for a few months before I'd have to start carrying other cards again, defeating the whole point of having it in the first place. So, at least for me, you were dead-on about EMV being another nail in the coffin. I ended up asking for (and receiving) a refund before they ever shipped, simply because of the EMV switch. By the time I was aware of the v2 Coin that supported EMV, Apple Pay was already announced, putting the final nail in the coffin. As TC said when he introduced Apple Pay, magnetic strip technology is sorely outdated. The fact that Coin and Samsung Pay can clone the magnetic stripe data from your credit card is reason enough not to use it. I had one and used it until Apple Pay came along. Now really I have stopped using Apple Pay just because many of my cards that offer rewards are not supported by it and its just easier to pull the credit card out and swipe it. So Fitbit bought a payment service just to shut it down?... what advantage did they gain from purchasing Coin? Every one of my rewards cards is supported. All with no annual fees. Apple Pay is also supported by Capital One, Chase and Barclaycard cards....which are the other major rewards providers, though several of them have annual fees. Wondering which reward cards you're using that aren't supported? The problem is more the acceptance of ApplePay at stores than the lack of support for cards. Oh, I totally agree with you. Unfortunately, here in the U.S., our businesses are, by and large, still living in the stone age where payments are concerned. Many businesses haven't bothered to upgrade their POS equipment to NFC-capable equipment. Of the businesses that have upgraded their POS equipment, some of those have purposely disabled NFC payments on their equipment. That's led to customer confusion, and rightly so. I can go to two different businesses that both have the exact same POS terminals and be able to use Apple Pay at one of the businesses but not at the other. As a business owner myself, I can't fathom a business not allowing a customer to pay using a mainstream payment method. As far as I'm concerned, Apple Pay, Samsung Pay, Android Pay, etc. should all be considered mainstream now. My philosophy has always been to allow people to give me money as many ways as possible so long as doing so doesn't create more of a headache for me. My business does not accept BitCoin, for example, because doing so would be an inconvenience for me. Businesses in the U.S. need to upgrade their POS terminals so they can accept chip cards anyway; so it boggles my mind why some businesses will do that upgrade and then purposely turn off functionality in the new POS equipment that is customer-friendly. I bought my 6+ thinking I'd immediately be using Apple Pay everywhere. Its taken awhile, but at this point, I'd say approximately half of my transactions are done with Apple Pay.